Things Prospective Students Won’t Tell You … Unless You Ask! We all know that prospective students don’t always tell us what they really think. Sometimes they don’t want to be completely honest about their REAL first-choice college because they think they’ll hurt our feelings. Or, they may tell us they had a great campus visit, yet tell their parents on the way home that they’ll never enroll. They often say one thing and do another. The fact is: These hidden issues are often deal breakers but, when uncovered and dealt with, they can lead to enrollments. Beginning today and over the course of the next few weeks we will share details from this fascinating study. Today we are sharing strategies and techniques you can use to uncover the things students are holding back. And, by the way, these aren’t strategies we created. These are strategies that prospective students told us will work in revealing their true impressions and feelings. These discoveries can be used immediately to enable richer, more fruitful conversations with the students you’re trying to recruit. Half of prospective students visiting a college campus will see and experience things that they find unappealing. Sure, students are not going to like everything they see at all of the campuses they visit. That’s not news. 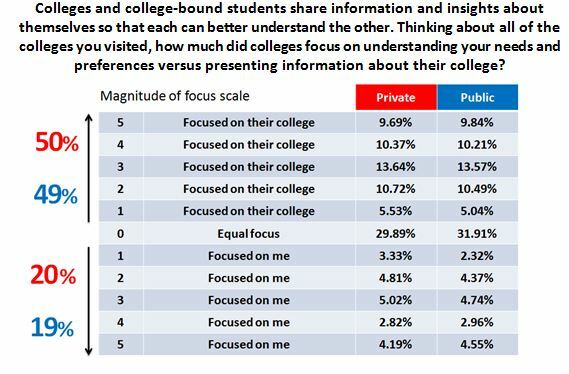 What’s newsworthy is the finding that colleges are not probing to uncover whether negative impressions exist and, more precisely, WHICH negative impressions may have formed. 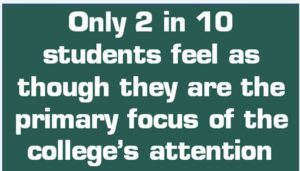 On average, only 13% of students say that an admission counselor ever inquired if they had seen or experienced anything the student found unappealing, concerning, or missing about their campus. After a campus visit prospective students are often asked for their general impressions. We say, “So, how was your tour today?” Or, “What did you think about our campus?” About 70% of students will easily share their positive impressions. Will they so easily share their negative impressions? No. Only about 10% will. Effective strategies to uncover what students really think. Prospective students, like most people, are naturally inclined to be kind and keep quiet when they see things they don’t like about our campus. However, 72% of students say they would be comfortable talking about their negative impressions if invited to do so. 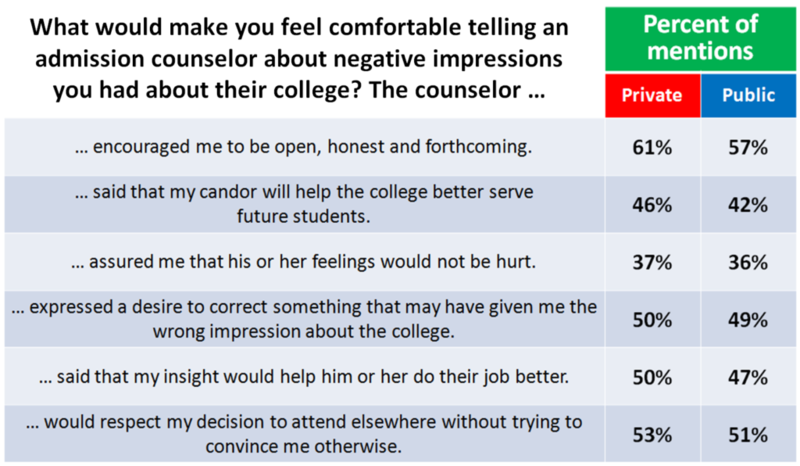 In a focus group we conducted with college-bound students in preparation for this study, students identified six things counselors can do or say that would prove effective in getting them to open up and share what they like and dislike the counselor’s college. Six statements/assurances students suggest that counselors use to get them to open up. Try it out and see what you uncover! Here’s how your interaction might play out using one of the assurance statements: “I’m glad you like the campus, especially the stadium/dorms/quad. It’s great, isn’t it? But let me ask, did you see anything that you didn’t like? And don’t worry. You aren’t going to hurt my feelings and it will help me do my job better.” Counselors often hold themselves back from asking penetrating questions because they’re concerned that students will perceive them as being intrusive. That’s so unfortunate. For both the counselor AND the student. Admission counselors who employ this approach tell us that they are often surprised by the answers they get. A misconception can be corrected or a concern alleviated. Not only do they get a real-time assessment of what the student is feeling, but they frequently uncover the ONE THING that will turn an admitted prospect into an enrolled student. It’s simple, and effective. We will soon release the complete report of this national study, along with its recommendations for action and new approaches in conversations between admission counselors and prospective students. If you would like an advance copy of the Hidden Influences report CLICK HERE. We help colleges and universities have better, richer conversations with prospective students to help them grow and shape enrollment. With our yield enhancement programs, interactive training workshops for counselors and other tools, we can help you too. Please call.